Since 2003, Mike Devries has been making his mark in the color portraiture scene in Southern California. 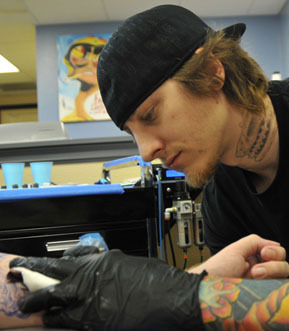 Raised in a working-class family, Mike was attracted to tattoos at a young age and learned the trade as soon as the opportunity presented itself. He soon developed a preference for color realism and began developing his signature high-contrast realism style that he is known for today. Since the early part of Mike's career, his work has been featured widely in tattoo publications and has won multiple awards. More recently, Mike has begun expressing the same kinds of imagery on canvas, exploring realism from other angles and experimenting with ways of creating a more painterly look on skin. He has produced an educational book on color portraiture, Let's Be Realistic, and a DVD, Get Real With Mike Devries, showing his techniques in closeup detail and explaining how he gets that signature look in his work.